Jeremy Corbyn not only faces the nonentity, Owen Smith, but a legal challenge in the high court. Jim Grant of Labour Party Marxists says the left must toughen up. Writing on the Labour leadership crisis is no easy feat for a weekly paper [this article was written for Weekly Worker, July 21 – Ed. ], so full is the saga with twists and turns, so leavened is the story with unconfirmed, rapidly disproven and probably maliciously spread rumours, and – in reality – so desperate and chaotically conducted is the struggle on both sides. Nevertheless, the overall shape of events is clear, and at the moment the picture is of a determined rearguard action by the right to minimise, by fair means and (mostly) foul, the chances of a second victory for Jeremy Corbyn. We begin with the quite astonishing vigour and almost endearing lack of shame with which the right attempted to stitch up the contest in its very mechanics. Readers will be aware of the broad outlines of the story: at the end of last week’s crunch meeting of the national executive committee, after Corbyn’s status on the ballot had been confirmed and one or two naive loyalists had left, the traitor bloc found itself with a narrow majority, and an item on the agenda before it called ‘any other business’. There, they took ‘business’ submitted to the meeting a whole 30 minutes before its beginning (according to NEC soft left Ann Black), the outcome of which was the wholesale disenfranchisement of a quarter of the party membership, the suspension of all meetings of constituency and ward branches, an eightfold increase in the registered supporter’s fee, and the constriction of the period for registration for the latter to two days. All in all, an unusually productive meeting of the NEC … Since then, we have had the suspension of Brighton and Hove District Labour Party for (let us be honest about this) daring to replace a rightwing local executive with a leftwing one at its recent annual general meeting. Whatever will Iain ‘Mugabe’ McNicol think of next? Again, what is striking about this is the sheer brazenness of the gerrymandering – so overt that it would shame 1950s Ulster Unionists or the Putin regime. Above all, it demonstrates that a substantial, dominant faction of the Labour Party apparatus has taken the side of the right in this whole farrago – something, of course, we already knew from the endless leaks of confidential data from the compliance unit to such friends of the labour movement as The Daily Telegraph and the Tory muckraker, Guido Fawkes. Their opponents are: the bulk of the trade union bureaucracy, perhaps surprisingly (with the exception of the GMB, whose leadership is playing its usual scab role over Trident); and the hundreds of thousands of Labour members either attracted by Corbyn’s campaign and victory last year or sick to the back teeth of the contempt in which Blairites, Brownites and the like held the rank and file, as its numbers dwindled to historic lows, and – evidently – all the more so now those members are getting assertive. The ‘anyone but Corbyn’ part of the coup has been proceeding with ruthless single-mindedness, in spite of the probably fatal setback of failing to keep the incumbent off the ballot – the latest legal challenge notwithstanding (see below). However, the ‘who exactly other than Corbyn’ part has been rather more tortuous. This is hardly surprising – it is, after all, a coup that has been launched on the principle of naked, apolitical careerism, the principle of opposition to principle. 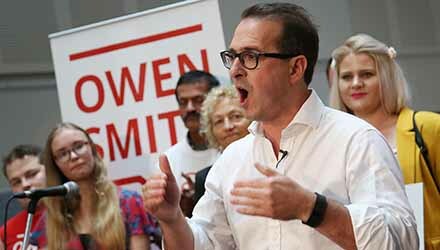 At least it is over now – Smith has the support of the Parliamentary Labour Party. His pitch was that he was the ‘soft left’, and that – being a relatively fresh face, having entered the Commons in 2010 – he would be better able to win over Jeremy Corbyn’s supporters (translation: he is not tainted by the Iraq debacle as obviously as Eagle). Enough of his co-conspirators in the PLP agreed for him to get 25 more PLP nominations than Angela Eagle (18 more overall, including MEPs). Indeed, the fact that nobody had heard of him until a couple of weeks ago is a distinct advantage – especially given that he is on record (as of 2006) as having supported, in vague terms, “the tradition of leftwing engagement to remove dictators”, while ducking the question of Iraq specifically (he voted for military action in Libya in 2011, however, which turned out just great); the carving off of parts of the NHS for the private sector; and PFI hospitals and academies.1 He was also, before formal involvement in politics, a lobbyist for the pharmaceutical giant, Pfizer. Of course, he now accepts he was wrong on most of these things – how could he not? Who would vote for some Blairite nonentity under these circumstances? In any case, we hope that voters in the coming election have the elementary intelligence to at least look the guy up on Wikipedia before they take his assurances of honest ‘soft leftism’ as good coin. He is a possibly reformed Blairite – but a traitor like the rest of them. The other tactic being deployed is the multiplication of accusations of ‘bullying’ and ‘harassment’. 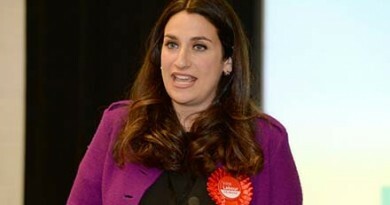 The suspension of Brighton and Hove appears to be on the basis that the outgoing officials considered the manner and comprehensiveness of their defeat a form of harassment; the interdiction of CLP meetings and suchlike across the board is supposedly a preventative measure against the excessive rancour and bile-spitting of Jeremy’s rabid Red Guards. In reality, the ‘honest’ trauma of Baxter and (perhaps) other ‘short-beaked pigeons’ of the Blair generation is exactly the same as the fabricated fear of more serious politicians – in both cases, what is not accepted is accountability. Both Baxter and Eagle, and Smith, and Hilary Benn, are conspirators against the clearly expressed will of their party. They have seized, as factional property, the principal means of disciplinary procedure. The only means available to ordinary members to hold their MPs to account are the very ones decried as ‘intimidation’ by the MPs – open ballots, verbal censure, and above all deselection and trigger ballots (of which we expect there would have been a good few, if CLP meetings had not been suspended). This is, unfortunately, an acute weak spot of the left, which has become in the main consumed by fatuous victimology over the past few years. This paper has argued repeatedly that ‘safe spaces’ and the interpretation of everything through the prism of preventing harassment is in fact a form of politics ultimately in service of the bureaucracy as a caste in society at large. The illusion that is possible to ‘do politics differently’, for a definition of the same that means we are all going to be terribly nice to each other or else, is one promoted heavily by the likes of Momentum, as with almost all leftwing political movements that present themselves as ‘new’. In doing so, the leadership of the Corbyn movement has disarmed its rank and file, holding back on deselection, collapsing disgracefully over the fabricated ‘anti-Semitism’ scandal – need we go on? In truth, politics is war by peaceful means. Whatever else we may think of the traitors, they at least understand this: thus, their tactics are not constrained unduly by high-minded attention to moral principle, focusing merely on the effective application of force. It had looked as though Corbyn would come out the other side of all this victorious. The plotters had lost the initiative, and had more or less been dragged, kicking and screaming, into an electoral contest, which the latest available data suggests they could lose by a demonstratively punishing margin. But now, of course, there is the previously half-expected legal challenge to the NEC decision to include Corbyn on the ballot. This has been brought by former Labour parliamentary candidate Michael Foster, who subsequently became a substantial donor to party funds, and both McNicol and Corbyn himself will be the defendants. Of course, it is useful for the PLP right that this challenge has been mounted by someone not directly involved in the battle. If it was successful then they could claim that they would have preferred Corbyn to have been defeated in a democratic ballot … But what can you do? However, will it be successful? That is very dubious, to say the least.3 So, assuming the challenge fails and Corbyn does indeed win the leadership contest, what will the right do then? Will Corbyn suddenly enjoy the confidence of Eagle, Smith, Benn and co, who have all hated him since day zero? What are they planning to do if he is re-elected? The official policy of the Corbyn office in this whole period has been, in paraphrase, that “we need to unite, at this time of all times, when the Tories are in turmoil” – and, now that the Tories are no longer very much in turmoil, to fight a general election in the short term against a government with no mandate. 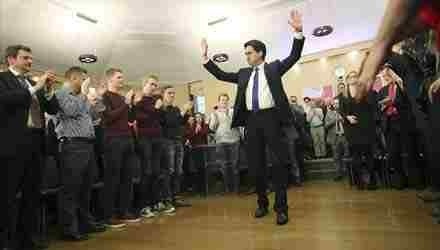 We doubt there is much else an old-fashioned party leader’s office can say at a time like this. Yet it is plain that it presents a fantasy, at best of rhetorical value (‘they started it’) and the principal dynamic is towards a split, and thus an ugly battle over every inch of political territory from Cornwall to the Outer Hebrides. Unity between the PLP as it exists and the membership it holds in such hatred and contempt is, at this point, impossible. There is merely victory, if we are bold, or defeat, if we allow ourselves to be disarmed. 2. Daily Mirror July 16. 3. See ‘Don’t rely on the courts’ Weekly Worker July 14 2016.